We love the work of Chihuly and have seen several of his designs. We recently took a tour of our local art museum which has a wonderful ceiling designed by Chihuly. The art director sent the kids home with a fun activity as part of our art class/museum tour. The kids were to create some Chihuly-inspired art projects. 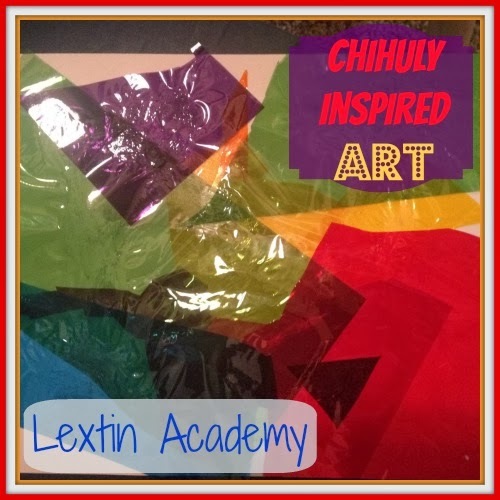 My kids cut the cellophane into fun shapes and then glued the pieces down on cardstock, layering them to blend and mix the colors. We ended up with beautiful color-mixed collages. Now my kids want to play with colored cellophane sheets every day! It was so fun! lol My kids loved cutting it and overlapping it on their papers. So shiny and colorful!